General overseer, Pastor Emily Morenike Ola-Ojo was born to the family of late Mr. and Mrs. Reuben Ahuda of Ise-Ekiti in Ekiti State. Early in her life, she gave her life to Jesus Christ and has remained steadfast ever-since. She had her educational/professional training as a teacher. She is a solid foundation member of Jesus is Light Ministries. 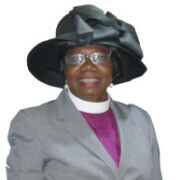 She left active teaching service to support her husband Apostle Joshua Babalola Oluwagbemiga Ola-Ojo; the late founder/President of the ministry-(Jesus is Light Ministries) where she has remained till now.As a result of her devotion to the work of God, she was called by God and subsequently ordained a Pastor in the Ministry. On the transition unto glory of her husband in September 2005, the entire council of Ministers of Jesus is Light Ministries unanimously chose her as the new General Overseer of the Ministry, an office she has occupied and proven with developments, signs and wonders. Pastor Emily Morenike Ola-Ojo, fondly called “Mama” is blessed with children and grandchildren..